City College’s River City Writers Series will present award-winning poet and playwright Gaylord Brewer on April 10 at noon in the Learning Resource Center room 105. Brewer will be speaking about his work, career and experiences, as well as reading from his newest poetry book, “Give Over, Graymalkin.” Following the talk, Brewer will sign copies of his book. According to his website, Brewer has a B.A. from the University of Louisville and an M.A. and Ph.D from Ohio State University. 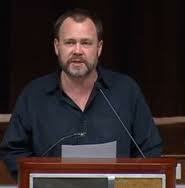 Brewer has written eight books of poetry and was the winner of the 2006 Orphic Prize for poetry. In addition, he authored a comic novella called “Octavius the 1st” in 2008. “Brewer has published over 800 poems in journals and anthologies, such as ‘Best American Poetry’ and the ‘Bedford Introduction to Literature,’ and his plays have been staged in Chicago, Columbus, Nashville, New York, and Valdez, Alaska,” says his website. Brewer has been a professor at Middle Tennessee State University since 1993. Brewer taught in various countries as well, including England and Russia. Brewer was also the recipient of the Individual Artist Fellowship award in 2009. For more information on Brewer and to view his poems, visit www.gaylordbrewer.com or contact English professor Jeffrey Knorr at (916) 558-2013 or knorrj@scc.losrios.edu. This entry was posted in Briefs, News, Sac City Express (SCC) and tagged brewer, center, college, faculty, gaylord, learning, library, poet, poetry, professors, resource, sacramento, speak, speech. Bookmark the permalink.